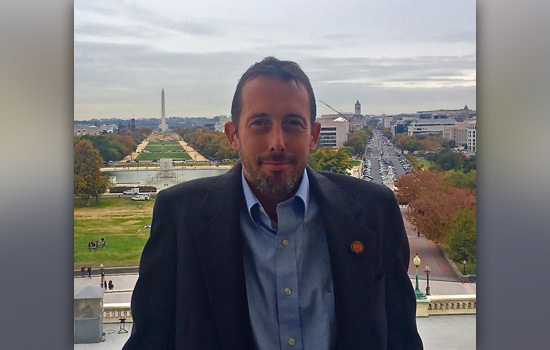 Andrew Phelps, director of RIT’s Center for MAGIC, briefed members of Congress Oct. 27 and stressed the vibrancy of the game development and publishing industry and its impact on the national economy. Andrew Phelps, director of Rochester Institute of Technology’s Center for MAGIC (Media, Arts, Games, Interaction and Creativity), participated in a briefing for members of the U.S. Congress in Washington, D.C., on Oct. 27, hosted by Entertainment Software Association and The Higher Education Video Game Alliance. Phelps joined representatives from the two organizations to discuss a new report that stresses the vibrancy of the game development and publishing industry and its impact on the national economy. New research reports that 1,641 video game development studios and publishing companies operate 1,871 separate video game facilities nationwide. The report also stated that 406 U.S. colleges and universities now offer graduate and undergraduate degrees or professional certificate in video game design and development—an increase from 390 in 2014. These college programs and game companies span 46 states and 84 percent of congressional districts. California leads the nation with 66 schools offering video game-related programs. Other leading states include Texas (29), Pennsylvania (26), Florida (21) and New York (20). According to a study conducted by the Higher Education Video Game Alliance— of which RIT is a founding member and Phelps is a founding member of the board—93 percent of program alumni have gainful employment one year after graduating and are earning an average salary of $76,200, or $24,000 more than the U.S. national average. Since 2010, RIT’s game design and development program in the School of Interactive Games and Media, B. Thomas Golisano College of Computing and Information Sciences, has consistently ranked in the top 10 at both the undergraduate and graduate levels by The Princeton Review. The college’s alumni are industry leaders in computer science, software engineering, computing and information science and imaging science. Alex Kipman, a 2001 graduate of the Golisano College of Computing and Information Sciences, is named as the primary inventor on more than 100 patents since joining Microsoft in 2001 and has led four major breakthrough products for the company, including Kinect in 2010 and Microsoft HoloLens. Two digital media projects in design at MAGIC have garnered numerous industry awards. Super Daryl Deluxe won the 2015 Intel University Games Showcase and the 2015 Microsoft U.S. Imagine Cup. The game’s creators, two RIT students, are incubating a gaming company in MAGIC Spell Studios. Another project, Splattershmup, created by an RIT class, was showcased at the Digital Games Research Association in Germany. The MAGIC Center and MAGIC Spell Studios launched at RIT in 2013, but a public-private partnership will help expand their efforts and culminate with a new building on the RIT campus. The building, which will break ground in 2016, will include a state-of-the-art studio, pre-incubation coaching space and a soundstage. Funding to date is at more than $30 million, including $13.5 million from New York state, $12.4 million from Cisco Systems Inc., $3 million from Dell and $1.5 million from The Wegman Family Charitable Foundation. MAGIC Spell Studios is expected to create 35 to 50 jobs in the first five years, with a goal of 100 jobs over the next 10 years, with the majority of these jobs in new gaming companies that would grow out of MAGIC Spell Studios. According to university officials, the goal is to help RIT students launch their own businesses and keep those businesses in Rochester, and RIT and MAGIC Spell Studios hope to lead the effort in attracting and developing a digital media cluster. RIT is also a world-renowned academic leader in digital media fields and nearly 1,000 widely recognized employers, such as Adobe, Microsoft, Disney, Boeing and Canon, regularly recruit RIT students to work at their companies.